Gluten-free breads are an enigma. They might not rise, if they rise, they might be dry.. if they are soft and moist, they might not taste good. The taste part though is just about getting used to it. 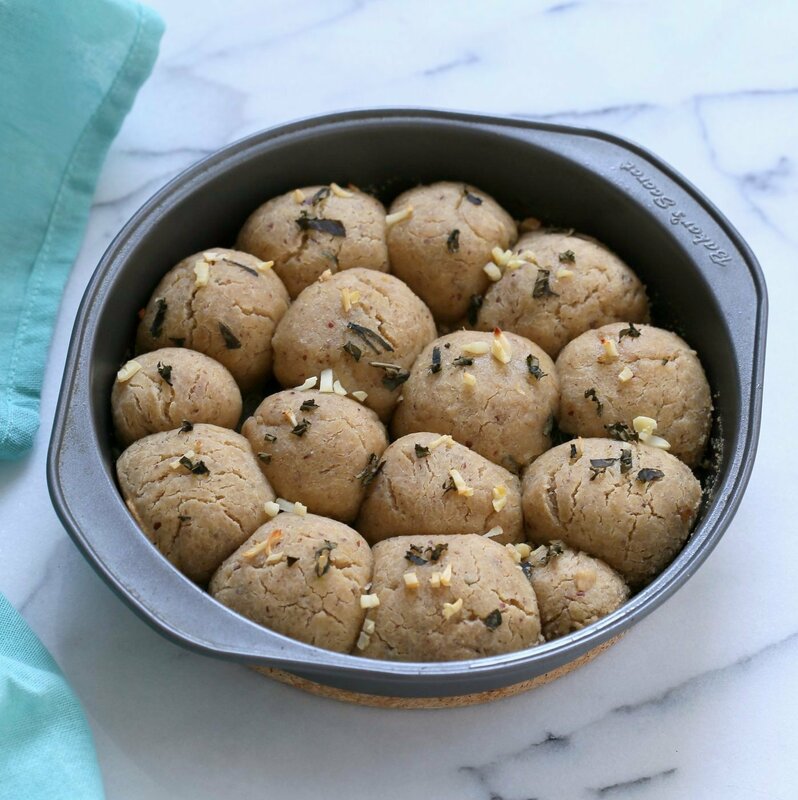 For eg, I would rather make this chickpea flour cake instead of multiple flour gf rolls. I know chickpea flour, I like the taste and texture and the cake is moist, and generally has better success rate :). For regular dinner rolls, the rolls do much better when you steam it. You can steam these rolls in a steamer, or bake them covered so they get steamed while baking. The bread is best served fresh and warm. To make ahead, you can make the dough and refrigerate. Let it come to room temperature, then shape into rolls and proceed with the recipe. If you make these let me know how you like them. More gluten-free bread options listed below. 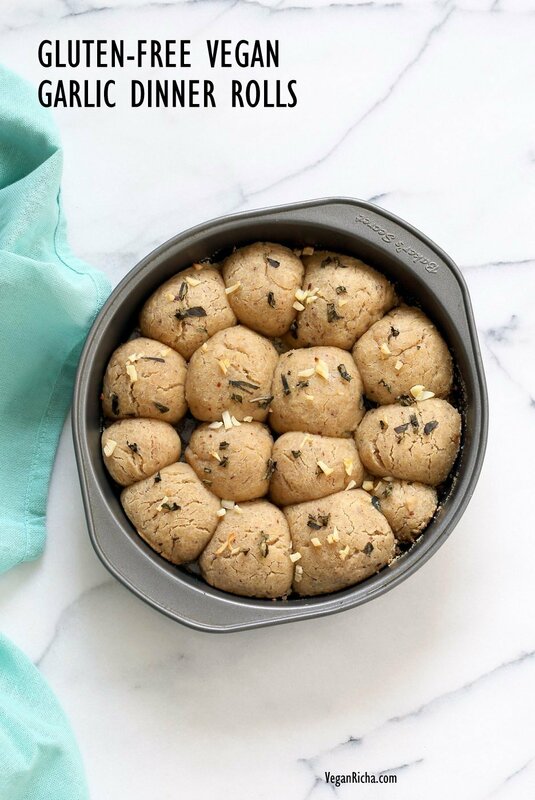 For regular with gluten rolls, see these 100% Whole Grain Soft Spelt Rolls., these Multigrain rolls or these white Dinner Rolls. Mix the dough and let it sit for 20 minutes. 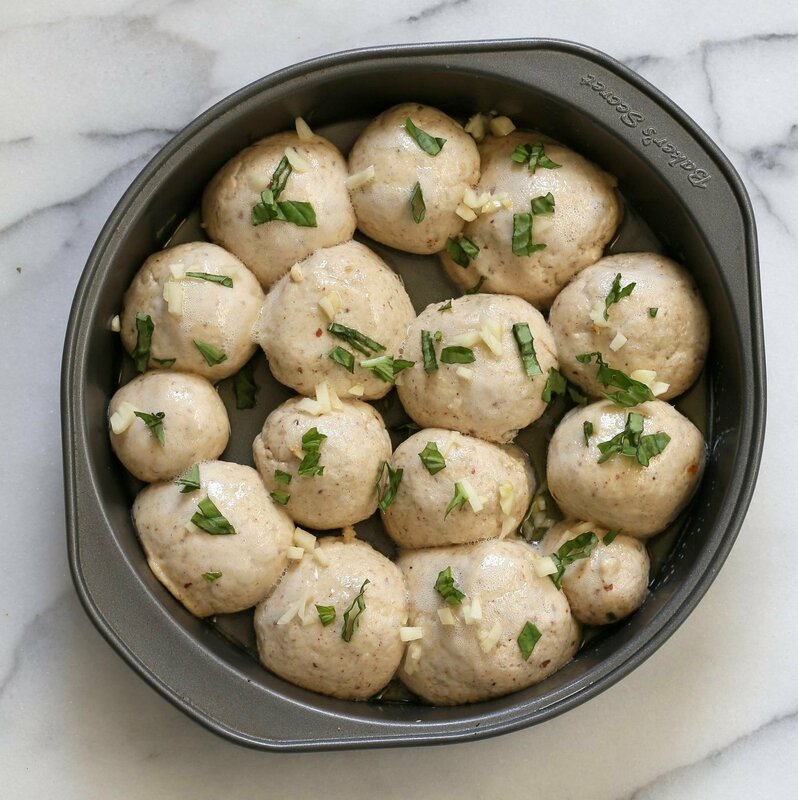 shape into small rolls and place in greased pan. Let the rolls rise for 20 minutes. Brush olive oil liberally and sprinkle garlic and basil on the rolls. Let them rise for a few more minutes, until atleast 1.5 times the original size. Cover with a parchment and bake. Cool for 10 minutes then remove from the pan. Brush or spray melted vegan butter or olive oil. Serve warm with vegan butter. In a bowl whisk all the dry ingredients for the bread and keep aside. In another bowl, combine water, yeast and sugar and let it sit until frothy. 5 minutes. Add the flax and mix in. Let it sit for a minute. Add the dry to the wet. Add in the yogurt and oil and mix well. The mix will be sticky stiff batter like dough. Let the sticky dough sit covered for 20 minutes. Grease or line an 8 inch cake pan or pie pan. 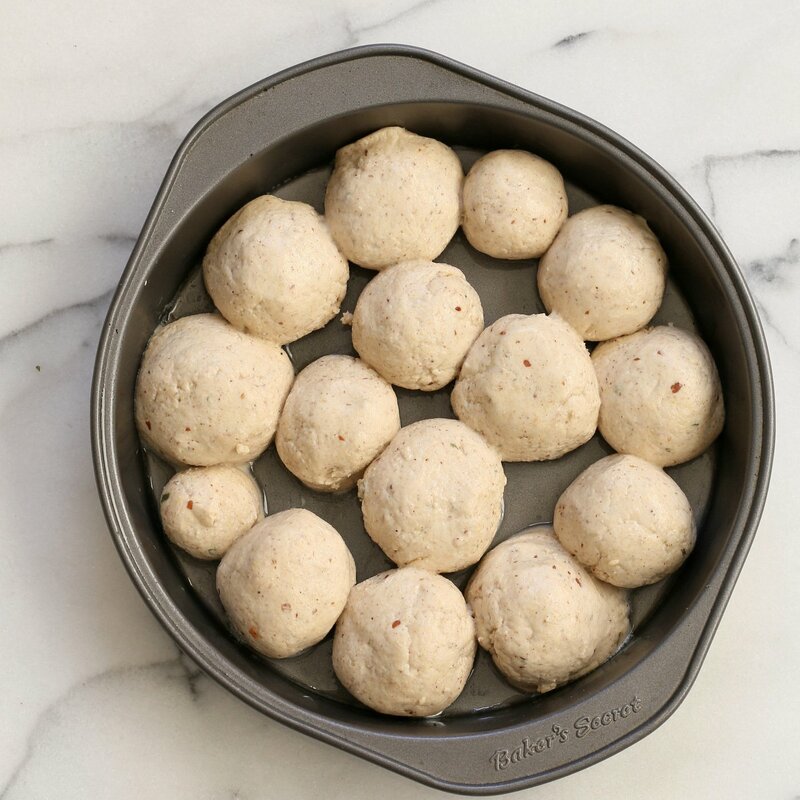 Using flour or oil on your hands shape the dough into small (1.5 inch or more) balls and place them 1/2 inch apart in the pan. Spray water liberally on the balls and let it sit for 10 minutes. Spray or brush olive oil liberally on the rolls. Sprinkle garlic and basil. Cover and let sit for 10 to 15 minutes near the warming oven. Let the rolls increase in size to at least 1.5 times the original. Preheat the oven to 375 degrees F / 190ºc. Cover the pan lightly with parchment or place a foil on top (important to cover the pan to capture steam). Bake for 24 to 25 minutes. Remove from the oven and let the rolls sit partially covered for 10 minutes. Remove from the pan and serve with vegan butter. You can brush additinal vegan butter or olive oil on the rolls before serving. To make ahead, you can make the dough and refrigerate for upto 2 days. Let it come to room temperature, then shape into rolls and proceed with the recipe. To steam the rolls, place rolls in a pan that fits the steamer. Steam for 25 to 30 minutes. Cool for 10 mins and serve. Variation: for higher rise, add 1/2 tsp xanthan gum to the dry ingredients. Hi could i replace the potato starch in this recipe with anything? These rolls look good. I’m guessing the garlic and basil flavors really make this recipe. 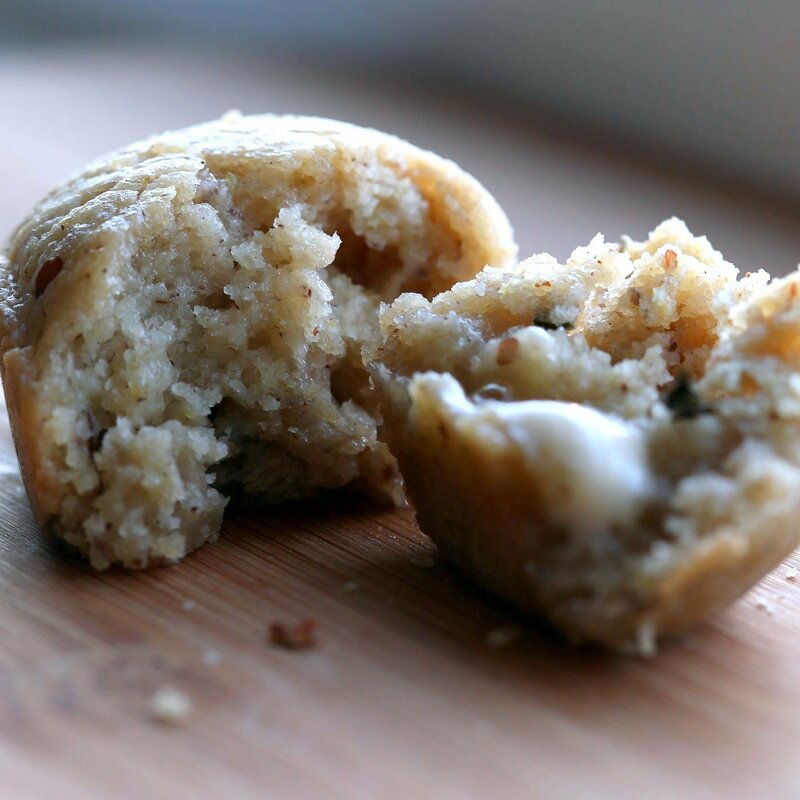 I made a plain, yeast-free variation of these. It’s the best gf bread I’ve made, my friend was happy. Can I make these in microwave? I’m a university student whose glutenfree vegan so to find recipes like these is like finding gems! yes it should work in a microwave. After the buns have risen, place in a glass or ceramic bowl, cover with parchment and try 1 or 2 buns at a time to figure out the cooking time. try 1 to 1..5 mins and microwave longer if the bun is not cooked. Could I replace the almond flour? I havent tried it. Almond adds a lot of volume so it would be hard to substitute. Richa, This is such a wonderful recipe. Thank you. I just poured the dough into a lined pie plate and baked like focaccia. great idea making it into a focaccia! Mine were still raw after 25 minutes in the oven. Has anyone else had this problem? I’m still baking them now but don’t want them to dry out. They smell fabulous! bake them longer. The size of the rolls, pan and the oven change the time needed. if they just dont cook through (which an happen if you took them out to cool, so the baking got interrupted and then put them in again), you can make croutons out of them. Cool, cube, bake at 300 degrees F until fully dry. Success! I let them bake covered for a bit, then uncovered for a while. They had already cooled so it took time, maybe 40 minutes additional. They got crusty on the outside, and they were delicious. My gluten-eating child declared them the best GF bread she’s ever had. My 12 and 15-year-old girls baked these tonight and we ate the whole thing. Awesome recipe, Richa! thats amazing! I am so glad they turned out well! Hi Richa…very nice recipe…is there any substitute for oat flour…My son had ulcerative colitis and avoiding oats..went gluten free…looking for any subs for oat flour…can i add GF all purpose flour..please advice. You can find certified gluten-free oats and make a flour at home. I havent tried these with the gf blend, but they might work. Maybe do half a recipe. I’m allergic to oats (and wheat). Any advice on substitution?